CENTURY CITY, CALIF. – Emmy® and Golden Globe® winner Kiefer Sutherland (TV’s “24”) comes face-to-face with the ultimate forces of evil in Mirrors, the deadliest horror film to look you in the face from the renowned director of The Hills Have Eyes, available on DVD and Blu-ray Disc (BD) January 13th from Twentieth Century Fox Home Entertainment. Dealing with post-traumatic stress syndrome, a former cop takes a job as a night watchman at an old luxury department store that was burned in a large fire. Soon after taking the job, he is haunted by horrific visions in the large mirrors of the store. Beyond projecting gruesome images of the past, the mirrors appear to be manipulating reality. As he investigates the visions, he realizes the malevolent, otherworldly force is using reflections as a gateway to terrorize him and his family. If he has any hope of saving his family, he must uncover the truth behind the mirrors. Written and directed by Alexandre Aja (The Hills Have Eyes, P2, High Tension), Mirrors also co-stars Amy Smart (Crank) and Paula Patton (Déjà vu, Hitch). Featuring one of the most iconic, shocking and gory “kill scenes” ever put on film, the Mirrors DVD unleashes a new fear with a bloodier unrated cut of the film too terrifying for theaters. 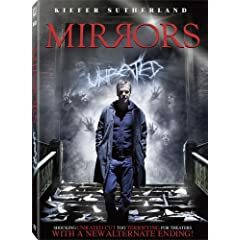 Additional DVD bonus features include an in-depth look into the myths and mythology behind mirrors, behind-the-scenes making-of featurette, deleted scenes plus a new chilling alternate ending. The Mirrors Blu-ray Disc features all of the standard-def DVD content plus BD-Exclusive elements including picture-in-picture director commentary, animated storyboard sequence, revealing character backstory featurette and a Digital Copy movie file for portable media players. Attempting to pick up the shattered pieces of his life, a disgraced former cop (Sutherland) takes a routine security job guarding the charred ruins of the once-famous Mayflower department store in New York. But the terrifying ominous images he sees in the building’s ornate mirrors will send him on a pulse-pounding mission to unravel the secrets of the store’s past…before they destroy his entire family! below. Last date for entries is February 18, 2009.